American military communications satellite. 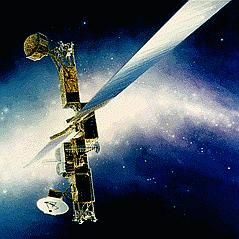 Milstar was a series of advanced US military communications satellites designed to provide global jam-resistant communications for military users. AKA: Military Strategic and Tactical Relay System. Status: Operational 1994. First Launch: 1994-02-07. Last Launch: 2003-04-08. Number: 6 . Gross mass: 4,500 kg (9,900 lb). Height: 12.00 m (39.00 ft). The Milstar system consisted of four Block 2 satellites in low-inclination, geosynchronous orbits. The operational system accommodated direct links to numerous, highly mobile Milstar ground terminals installed on vehicles, ships, submarines and aircraft. The first two Block 1 spacecraft, launched in 1995, were eventually replaced by the Block 2 Milstar 3 through 6, which were launched beginning in 1999. The full Block 2 constellation allowed as many as 10,000 users to access the system at any given time. The spacecraft was 3-axis stabilized, with two large solar arrays. The second spacecraft (F2) carried 398 kg of ballast to replace a classified payload which was removed. The Block 1 satellites had costly nuclear hardness and survivability features which were not included in the four Block 2 satellites. Two crosslink dish antennas located at opposite ends of each spacecraft connected all four Block 2 satellites to form a secure constellation controlled from a single fixed or mobile control station. Crosslink operations were performed at or near frequencies that were absorbed by Earth's atmosphere, preventing detection by Earth-based ground stations. The satellite and ground station designs also incorporated advanced signal processing/encryption technologies to deny access of downlinked signals to unauthorized users. The Low data rate (LDR) EHF payload was built by TRW and had 192 channels with rates between 75 and 2400 bps. Block 2 spacecraft carried the LDR in addition to a Medium Data Rate (MDR) payload built by Hughes. The MDR provided rates of 4800 bps to 1.544 Mbps per channel. The MDR payload also included two nulling spot antennas that could identify and pinpoint the location of a jammer and electronically isolate its signal, allowing Milstar users to operate normally and at full capacity with no loss in signal quality or speed, despite any attempt by hostile forces to jam or intercept its signal. The Defense Department's Milstar, distinguished itself as the first of its kind in several groundbreaking advancements: the first satellite system to allow all branches of the U.S. Armed Services to communicate with one another on the same secure network; the first to operate at extremely high frequencies; and the first to provide satellite-to-satellite communications. 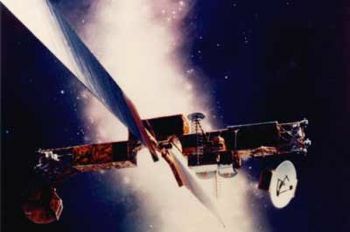 Milstar's "switchboard-in-the sky" operational concept was considered revolutionary because the satellites handled all processing and traffic management chores without ground station relays, greatly enhancing data security and jam resistance. Lockheed Missiles and Space, as prime contractor and systems integrator, led a team responsible for designing, building and launching the system. Two Milstar satellites were launched in 1994 and 1995 aboard Titan IV-Centaur boosters built by Lockheed Martin Astronautics. Software updates to the satellite memory increased Milstar's flexibility and operation. Family: Communications, Geosynchronous orbit, Military communications sat. Country: USA. Launch Vehicles: Titan, Titan 4, Titan 4B, Titan 401A/Centaur, Titan 401B/Centaur. Launch Sites: Cape Canaveral, Cape Canaveral LC40. Agency: USAF, Hughes, TRW, Lockheed. Bibliography: 2, 296, 552, 554, 6, 6710, 12837, 12838. 1994 February 7 - . 21:47 GMT - . Launch Site: Cape Canaveral. Launch Complex: Cape Canaveral LC40. LV Family: Titan. Launch Vehicle: Titan 401A/Centaur. USA 99 - . Payload: Milstar 1-01 / DFS 1. Mass: 4,500 kg (9,900 lb). Nation: USA. Agency: USAF. Class: Communications. Type: Military communications satellite. Spacecraft: Milstar. USAF Sat Cat: 22988 . COSPAR: 1994-009A. Apogee: 35,790 km (22,230 mi). Perigee: 35,733 km (22,203 mi). Inclination: 12.00 deg. Period: 1,434.00 min. Air Force Space Command launches the first Milstar satellite, a new generation military satellite communications system. Positioned in geosynchronous orbit at 90 deg W in 1994; 120 deg W in 1995-1999..
1995 November 6 - . 05:15 GMT - . Launch Site: Cape Canaveral. Launch Complex: Cape Canaveral LC40. LV Family: Titan. Launch Vehicle: Titan 401A/Centaur. USA 115 - . Payload: Milstar DFS 2. Mass: 4,500 kg (9,900 lb). Nation: USA. Agency: USAF. Class: Communications. Type: Military communications satellite. Spacecraft: Milstar. USAF Sat Cat: 23712 . COSPAR: 1995-060A. Apogee: 35,787 km (22,236 mi). Perigee: 35,787 km (22,236 mi). Inclination: 10.00 deg. Secure military communication. Positioned in geosynchronous orbit at 4 deg E in 1995-2001. As of 2005 Mar 14 located at 10.26E drifting at 0.012E degrees per day..
1999 April 30 - . 16:30 GMT - . Launch Site: Cape Canaveral. Launch Complex: Cape Canaveral LC40. LV Family: Titan. Launch Vehicle: Titan 401B/Centaur. FAILURE: Centaur software programming error.. Failed Stage: U.
USA 143 - . Payload: Milstar-2 F1 / DFS 3. Mass: 4,500 kg (9,900 lb). Nation: USA. Agency: USAF. Manufacturer: Lockheed. Class: Communications. Type: Military communications satellite. Spacecraft: Milstar. USAF Sat Cat: 25724 . COSPAR: 1999-023A. Apogee: 5,149 km (3,199 mi). Perigee: 1,097 km (681 mi). Inclination: 28.20 deg. The Titan core vehicle operated correctly, but a software error in the Centaur stage resulted in all three planned burns being made at the wrong times, during the first orbit instead of over a six hour period. The three burns planned to place Milstar successively in a 170 x 190 km parking orbit, a geostationary transfer orbit, and finally geosynchronous orbit. Instead, at 19:00 GMT, several hours before the scheduled third burn, Milstar separated into a useless 740 km x 5000 km orbit. Milstar-2 F1 was the first upgraded Milstar with an extra Medium Data Rate payload with a higher throughput. The payload included EHF (44 GHz), SHF (20 GHz) and UHF communications transponders and satellite-to-satellite crosslinks, with narrow beams to avoid jamming. 2001 February 27 - . 21:20 GMT - . Launch Site: Cape Canaveral. Launch Complex: Cape Canaveral LC40. Launch Pad: SLC40. LV Family: Titan. Launch Vehicle: Titan 401B/Centaur. USA 157 - . Payload: Milstar-2 DFS 4. Mass: 4,670 kg (10,290 lb). Nation: USA. Agency: USAF. Manufacturer: Lockheed. Class: Communications. Type: Military communications satellite. Spacecraft: Milstar. USAF Sat Cat: 26715 . COSPAR: 2001-009A. Apogee: 35,768 km (22,225 mi). Perigee: 35,764 km (22,222 mi). Inclination: 4.50 deg. Period: 1,435.05 min. Military Communications satellite. Launch delayed from October 30, December 14, 2000, and February 2 and February 24, 2001. The Milstar DFS 4 satellite (the second Milstar Block 2) provided secure communications for the US Department of Defense, with UHF, EHF and SHF band transmitters. Titan 4B-41 with core stage K-30 took off from Cape Canaveral and placed Milstar and the Centaur TC-22 upper stage in a suborbital trajectory. TC-22 then ignited to enter a 200 km parking orbit, and after two more burns delivered Milstar to geosynchronous drift orbit. Small engines on board the Milstar placed it at its targeted geostationary position. USA 157, a 4.5 tonne spacecraft, was the first in the Milstar 2 series which was capable of higher data rates and was more secure against disabling efforts. 2002 January 16 - . 00:30 GMT - . Launch Site: Cape Canaveral. Launch Complex: Cape Canaveral LC40. Launch Pad: SLC40. LV Family: Titan. Launch Vehicle: Titan 401B/Centaur. USA 164 - . Payload: Milstar 2-F3 / Milstar FLT-5 / DFS-5. Mass: 4,550 kg (10,030 lb). Nation: USA. Agency: USAF. Manufacturer: Lockheed. Class: Communications. Type: Military communications satellite. Spacecraft: Milstar. USAF Sat Cat: 27168 . COSPAR: 2002-001A. Apogee: 35,800 km (22,200 mi). Perigee: 35,773 km (22,228 mi). Inclination: 1.46 deg. Period: 1,436.12 min. Military Communications satellite. Launch delayed from December 2001. The Titan core stage shut down 9 min after launch on a suborbital trajectory, and separated from the upper stage, Centaur TC-19. TC-19 made three burns to parking orbit, geostationary transfer orbit, and finally geostationary orbit. It then released Milstar Flt-5. Milstar provided secure communications in the EHF, SHF and UHF bands and would be stationed over European longitudes. As of 2007 Feb 16 located at 29.98E drifting at 0.014W degrees per day. 2003 April 8 - . 13:43 GMT - . Launch Site: Cape Canaveral. Launch Complex: Cape Canaveral LC40. Launch Pad: SLC40. LV Family: Titan. Launch Vehicle: Titan 401B/Centaur. USA 169 - . Payload: Milstar 6 / Milstar 2-F4. Mass: 4,500 kg (9,900 lb). Nation: USA. Agency: USAF. Manufacturer: Lockheed. Class: Communications. Type: Military communications satellite. Spacecraft: Milstar. USAF Sat Cat: 27711 . COSPAR: 2003-012A. Apogee: 35,811 km (22,251 mi). Perigee: 35,762 km (22,221 mi). Inclination: 0.91 deg. Period: 1,436.13 min. Delayed from November 4, 2002, and January 21, February 2 and 4, March 5, 8 and 21, and April 6, 2003. As of 2007 Feb 4 located at 89.84W drifting at 0.014W degrees per day..